Apparently all it took to animate our President was to officially confirm his Lame Duck status. After the drubbing he sat-out from a bit over one-half of one-third of the electorate, he has approached his job with new urgency, and action. Maybe he was just resting-up over these past few months. First, he jetted off to China and Australia for APEC and G-20 Summits. 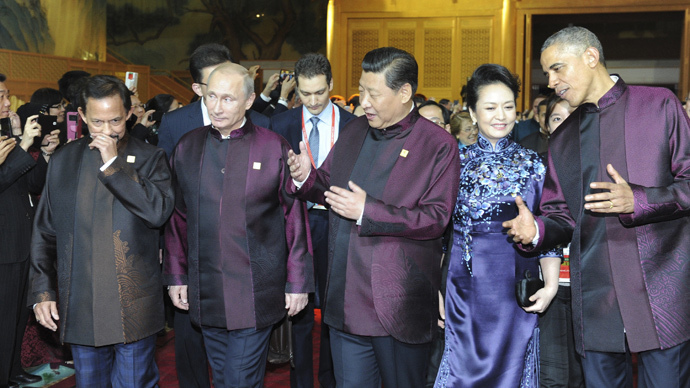 Upon arrival, he rocked the host country's spiffy purple get-up, managed to isolate our nemesis Mr. Putin regarding Ukraine, achieved commitment of First World leaders to expansionist economic policies (finally! ), and flew home with a surprise US-China climate pact that sets the stage for a broader, global agreement next year. Implementation work will begin in LA (where better?). When the world's two biggest carbon polluters make directional progress to reduce emissions, it helps everybody else get to the table in an agreeable frame of mind. That's some agile duckitude, but he wasn't finished. This week, he finally made good on his promise to take unilateral action on domestic issues when Congress refuses to govern. In particular, he formally, finally announced executive action to focus immigration enforcement resources on finding and deporting that portion of the eleven million souls here without papers, who are up-to-no-good. His action also paves the way for some five million illegals to emerge from the shadows. For the record, 6.7 million are from Mexico, and 1.2 million from Asia ? five of the top ten countries-of-origin are Asian. Some two million people have been deported during the Obama Presidency ? indeed, the advocacy organization La Raza calls him the Deporter-in-Chief. A bit of historical context, here. The failed immigration system of our fair land has been a festering problem since before those misty, water-colored Reagan years. That administration passed IRCA, the most recent inadequate overhaul, in 1986, and both he and Mr. Bush, the Elder took similar executive actions on behalf of illegals here at the time. In his 2013 State of the Union address, the current President urged: "Let's get this done. Send me a comprehensive immigration reform bill in the next few months, and I will sign it right away." The Senate, with supporters and opponents on both sides of the aisle, hammered-out a bi-partisan bill in June, 2013. In the ensuing year-and-a-half, the House has refused to consider the Senate bill, and has not crafted its own version. There have always been enough votes to pass it, but Speaker Boehner refused to bring it up -- fearing a rift in his own Party between the pass-oriented moderates and the punishment-seeking TeaPers. Governing is hard, and sometimes the hardest fights are within the walls. It seems that voting 54 times to repeal ObamaCare was less difficult for that body of political thespians. So what the Prez did last week is not only pragmatic and humanitarian (and I believe it's legal), it is also a goad to the Congress, to, you know, actually Govern. Intractable opposition -- that GOP staple of the past six years -- is a whole lot easier, and it has been remarkably successful, politically. Governing is more difficult, involving hard choices and accountability, inside and outside the friendly Party confines. It's not clear that they will actually act, however. In the wake of the immigration action, House Republicans finally filed a long-anticipated lawsuit against the Administration, regarding its implementation of ObamaCare. We'll set aside, for now, the irony that they claim the hated health care law was not implemented fast enough. Part of the filing delay derives from the fact that the first two law firms who agreed to handle the matter ? both excellent, mainline establishments (Baker Hostetler and Quinn Emanuel) both withdrew from the representation. The GOP claims that their 'liberal business clients' objected, but just pause and let that phrase roll around in your brain for a sec. The much better explanation is that they concluded it's a dish worthy of your Thanksgiving table (which it is). Still, litigating, too, is easier than governing. Perhaps impeachment will follow, as their next time-waster? But here's an alternative ? pass a bill and force to Administration to deal. In a broader political sense, the Midterms Democrat debacle (such as it is, meaning it's a lot less than reported by the herd) derives from the fact that they allowed the GOP to control the dialog. Too many Dem candidates have become Republican-light. Republicans won because Democrat voters stayed home, in dismay at the wretched alternatives with which they were presented. If the Dems want to win in 2016, they need to start acting like Democrats, and present "a choice, not an echo" (Remember that one? It's a great image, even if it didn't work out so well for Mr. Goldwater). They will have to move Left, channeling anger against worsening economic inequity in general, and Wall Street in particular. They must champion tax rate reform, carbon pollution initiatives, values-based foreign policy, campaign finance reform and personal privacy. It's not clear that they will, as frontrunner Hillary Clinton is hawkish and has hands deep in the deep pockets of the money-changers. Grace of the horrid Citizens United Supreme Court decision, Big Money does have a strong grip on policy. That stranglehold must be broken, if democracy is to long endure. Citizens with money are much 'more equal than others' who lack such resources. Still, Senator Warren's ascension to policy prominence within the restive Democratic coalition conveys a certain level of optimism. And, freed of the surly bonds of political expediencies and cautions of meeker colleagues, Mr. Obama has made a good start on the process. He's finally dancing to his own tune again, and looks more nimble than lame. That's some duck. I almost wrote on the same topic. My title was "Lame duck keeps hopping along." I decided to keep out of Federal duck doo doo, and stick to a local, or at least a non-political blog this holiday season. BTW if Internet polls are any indication, Hillary is no longer the Democratic frontrunner. Elizabeth Warren is the frontrunner now. She might face a draft if she doesn't willingly accept the nomination. Hillary is toast, whether she runs or not. She would be a gift to whomever the Republicans nominate. and leave you stranded out in the cold. Still you wouldn't change it for a sack of gold. Let's go on with the Show." HI Roz -- appreciate your forbearance. It's awfully early, but the Prez may have tipped his own hand (fwiw) by referring to Americans' desire for "that new car smell." Hillary is a 1992 Model C.
Not sure who moves first, but IF the Dems go with somebody like Sherrod Brown or Warren on the Left, the GOP conservatives would be wise to hold their ideological noses and nominate Jeb Bush -- to capture the center. Their noses have always been particularly discerning for purity, however. I"m not sure how you can call Obama's immigration action legal. We have a laws that spell out how people and enter this country along with border patrol and ICE agents to make sure these laws are followed. Let's not forget that Obama has sworn twice to uphold the laws of this land when he bacame president. Anyway, Obama has chosen to ignore the laws we have instead of working within the system to change them as he should. In so doing he made fools out of our brave sheriffs, border patrol agents and ICE agents who still have to follow the immigration laws. How are they expected to do their jobs now? What backing do they have? The bigger question is why do we even have a border anymore if we aren't going to defend it? And what about all the honorable people in other countries who have paid their fees, and filled out their forms? Now they have egg on their faces for doing the right thing. Why wait years when you can just get across the border on your own and if you hide out long enough, you'll get amnesty like all the others? Don't get me wrong. I'm not against immigration at all, my wife came here on a green card after doing things the right way. I just want the chance to check out who is coming in here to make sure they aren't criminals running from the law, or sick with horrible contagious deseases, and that they have some means or skills to suppport themselves when they get here. I?m excited about Emperor Obama?s immigration decree. It will save me money. It means I?ll probably be able to pay my housekeepers and gardeners even less than I already do, if that?s possible. I?ll also pay less when I dine. Follow the logic: Obama?s immigration amnesty will attract even more illegals. They will flood the labor market with even more cheap labor, depressing low-skilled wages. Cheap labor is why corporate Republicans support amnesty for illegals. Cheap labor reduces the power of labor unions, increasing corporate profits, which helps stock portfolios. Liberals love amnesty, of course, as Liberals give away welfare and other free goodies, ensuring more votes for Democrats. Amnesty is a win-win for everyone, except for working-class Americans and tea party types. The same is true for Obama?s free-trade agreements. These agreements allow corporations to avoid high-cost American labor and instead acquire low-cost goods made from cheap foreign labor. If Mr. Obama was an Emperor, your head would be on a pike. An emperor would not wait 500 days for the House to act, especially when, from day 1, they already had a Bi-Partisan bill and the votes to pass it. "The executive order is not amnesty. It does not grant citizenship or even permanent residency. It is a temporary reprieve from being deported and gives the people an attempt to get their immigration status corrected. It only applies to a specific group of people. The illegal mother and/or father of that child that is born in the U.S.
All of them must be in good standing with the law. They must have no criminal records or ties to terrorism. None on this list will have access to social welfare or any other form of government assistance." And None of your impacts results from amnesty, anyway. They exist now. Future border crossing attempts will not relate to amnesty, either. They will relate, as they do now, to the relative states of the US, Central American and other economies, and the demographics of those 'sending' societies. So, other than being wrong about everything, that was a pretty good post. Thank you, oh Mighty Obama, for not putting my head on a spike. You are truly merciful, indeed. I hereby confess and beg for your mercy, oh great one. For 500 days, you waited patiently, and with much restraint, for Congress to pass an immigration bill that was to your liking. You grew impatient with the democratic process of our republic and issued your mighty decree, as is your right, oh mighty ruler. May you and her Excellence, Elizabeth Warren reign over us forevermore. Good -- so even you see the obvious absurdity of the Emperor claim. Obama did not "wait for a bill of his liking" -- he waited for "a" bill. "Any" bill. "At all." The GOP got shots in the Senate, where it passed in veto-proof fashion with a bunch of Republicans on-board, and the House, where they never brought out the Senate version, which would have passed -- or Any Other Bill for a year-and-a-half. That's not the democratic process -- that's hostage-taking. Or caucus schizophrenia -- take your pick. Oh, and careful what you wish for, even in sarcasm. That Warren thing has a nice ring to it, even if it's unlikely. .
Why, exactly, should the republicans do anything? For crying out loud there are laws on the books that have been ignored by all the administrations since 1986! Another thing that has gone unnoticed is that the democrats had two years, TWO YEARS! of a filibuster-proof majority to push and pass any agenda they wanted and what happened? So again I ask, why should they do anything? This is just plain old politics...both sides playing the middle. And BTW, the registered Herman Gates is not the same HG. Yes, looking forward to seeing Elizabeth "Fauxcahontas" Warren running for president. Obama just cooked Hillary's goose by talking about her and that "new car smell". Tom, seriously...you believe all that happy-talk about how the amnesty that isn't amnesty is only temporary and for a few law-abiding illegal aliens? You'll never learn. @Gruber : "Yes, looking forward to seeing Elizabeth "Fauxcahontas" Warren running for president. Obama just cooked Hillary's goose by talking about her and that "new car smell"." You Republicans can make fun of Obama's "new car smell" endorsement of Hillary (and, yes, that was rather strange wording) or fun of other Democratic candidates, but the bottom line is that carping about the other side's candidates is not enough. You've been doing that for so long that you've seem to have forgotten that you need to produce viable candidates of your own. Good luck with that. Palin is still around as a constant reminder to the nation of the Republican Presidential ticket debacle of 2008, and the best you could come up with in 2012 was Mitt Romney, a man who even many Republicans didn't particularly care for. Better spend your time coming up with someone better rather than wasting time throwing catcalls at potential Democratic candidates. Mr. Cushing leaves out some inconvenient facts. President Obama promised an immigration solution ("La Promesa") in his first year but then did nothing. Having made that promise, he had control of both houses for his first two years but did nothing. He spent the following three years telling us at least twenty times in various recorded speeches that he did not have the executive power to change the immigration system because "that's just not how our government works under the constitution" or words to that effect. Then only recently he changed his mind and started promising executive action last summer. But when polling suggested that such action would hurt Democrats in the fall election, he postponed action until after the election. And when it looked like one or more Democrats might face run off elections after the election he further delayed his actions. Now that Senator Mary Landrieu looks like a sure loser (Cassidy is up by 15 points in latest poll) on December 6th, he courageously took action. Why? Because he couldn't wait any longer! Ah, so those delicate GOP wall flowers were just wishin' and hopin' and thinkin' and prayin', plannin' and dreamin' that the dashing Mr. Prez would ask them to dance? They have no agenda of their own, other than to oppose the President? That's what I thought. Governing is harder than the simple act of rejection, and after six years, they seem to be out-of-practice. You know, a better explanation might just be that the GOP knows that its proposed solutions are bound to drive more voters -- Asian, Hispanic and otherwize into the Democratic tent. They concluded that there's just no future in that, and they're correct. If I might borrow the words of the blogger, another inconvenient fact that will go without a real response is that the recent elections showed that Democrat policies have moved more voters -- Asian, Hispanic and "otherwise" into the Republican tent. @Doug Miller: "If I might borrow the words of the blogger, another inconvenient fact that will go without a real response is that the recent elections showed that Democrat policies have moved more voters -- Asian, Hispanic and "otherwise" into the Republican tent." Well, speaking as a part-Asian, I doubt that what you say is true. I think that the Republican party, as usual, benefitted from the low voter turnout during an off-Presidential election year. In addition, given the very disrespectful treatment that conservatives and Republicans gave America's first black President, I urge all Asian, Hispanic, and other minority voters to consider this: What kind of treatment do you think that conservatives and Republicans will give America's first Asian President or Hispanic President? Nuff' said. As usual, there is an absence of any linkages in support of claims from Mr. Miller. If you go here Web Link, you see that the only group that voted significantly more Republican by percentage was Asians -- and that stat can be thoroughly accounted-for by lower turnout. More Asian Repubs voted while the Dems generally and Asian Dems specifically stayed home; therefore, the percentage of GOP Asians appears higher, without the number of GOP Asians growing. As indicated in the blog, GOP ideas did not win this election -- the absence of Democrat ideas lost it. Factor missing here is, registered democrats are voting republican tickets. Exit polling done by Pew Research shows that Latino support for Democrats dropped from 68% in 2012 to 60% in 2014. And as Mr. Cushing has acknowledged, Asian support for Democrats dropped from about 73% in 2012 to 52% in 2014. And there was modest improvement in the number of African-Americans voting for Republicans in 2014. While these shifts might seem insignificant to Mr. Cushing, they were devastating to Democrats. And before someone says that Obama wasn?t on the ballot this time, well, get used to that. Some African-American Republican candidates made history in this election. Tim Scott became the first African-American to be elected to the Senate from the South in more than one hundred years. He also becomes the first African-American to be elected to both the House and Senate. Mia Love becomes the first African-American Republican woman to be elected to the House. Latino Republican governors were overwhelmingly re-elected in New Mexico and Nevada, two states that had been trending Democrat. There are many other encouraging examples for Republicans. It wasn?t the lack of Democrat ideas that led to their historic loss in the 2014 election; it was that the voters soundly rejected their ideas. Any time somebody's side wins, the human tendency is to create a narrative that fits the preferences (and v-v, of course). As a liberal, I hope the GOP concludes that the Republican Century is upon us. Working with percentages and isolated anecdotes will do that. Here's what I mean about the turnout effect. Let's take 100 likely voters, say Asian heritage, whose tendency has been to vote 65-35 Dem. If 40 of them stay home and 30 of those are likely Dems, then Presto: the numbers become 35-25 votes, or 58-42%. So, as the blog indicates, the key for the Dems is to energize that base so they DO come out in 2016. Major element of the prescription would be to boldly address the malaise of the middle class, head-on, and break through that silly class warfare trope. If the GOP is right and their 'ideas' are in ascension, it won't work and the Dems will go down in flames. My own guess, admittedly as a partisan, is that it would. Well, that's progress of sorts. Mr. Cushing acknowledges that Democrat class warfare tactics have not been helpful. But then why does he resort to talking about turnout for various segments of the voting population? As a Republican, I hope that Democrats will follow Mr. Cushing's recommendations and become even more liberal. And I am grateful that Democrats in the House and Senate have decided to retain Pelosi and Reid. That is a gift that will keep on giving. Oh Yikes, no progress. I meant that the GOP's trope about attempts to incite 'class warfare' has worked so well that the Dems haven't even challenged it as the nonsense it is. Anyone who looks at the Massive transfer of wealth from the middle class to the crusty uppers over the past 40 years, and Doesn't understand that there is already a class war being won by the well-to-do ... is probably well-to-do. Jackie Kemp's rising tide has lifted the yachts, but it swamps all the rowboats. And on that happy note, I'm going to my veggie-chopping duty, in my annual quest to make an edible stuffing that's actually healthy. So, Happy Thanksgiving, all -- we all have much for to be grateful. Yes, we all have much to be thankful for on Thanksgiving Day and every other day. On that we can agree. Happy Thanksgiving Mr. Cushing. Yes, Happy Thanksgiving to all - at the end of the day we live in a country where debates like this can still go on, while in many parts of the world this kind of discourse would prompt a knock at the door by govt goons. Ah yes, all day tomorrow with nothing to do but watch football and eat turkey, then the wife goes to the Black Friday sales and I have the house to myself. It's great to be a man! > at the wretched alternatives with which they were presented. Following this scapegoating of election results, any party, in any election, could claim the reason they lost was simply due to insufficient turnout of their base, as there are always potential votes available. Isn't voter apathy in and of itself representing a vote against through inaction? > and Wall Street in particular. Obama did little in this regard other than speeches (perhaps that's your point), and one could argue is more in bed with Wall Street than Bush I and II by any meaningful metric (money spent on bailouts/subsidies, campaign contributions, prosecution ignored, lobbyists/cabinet appointments). I would posit that a Democrat move to the left might engage more of the base, but a move to the middle would widen the tent increasing the # of potential votes. Warren is the current media darling of the left, but think how powerful a candidate not in the classic left/right mold like Brian Schweitzer (D) would be? He holds positions on both sides of the political spectrum, pro-choice, pro-gun, pro-energy, anti-war, fiscally moderate (he has to be in Montana), and a very strong immigration supporter. I know many moderates and Libertarians who would not vote for a Warren under any circumstances, but would easily vote for Schweitzer over a Cruz, Bush or Romney. My suggestion: consider widening the tent rather than rallying the troops. Many Democrats speak of gridlock as if it was a bug in our system of government rather than a feature (until the shoe is on the other foot, of course). Yes, it has been very irritating these last 4 years, on both sides I might add, but in years past we also had more compromise between parties and Presidents willing to lead on creating the compromise. The GOP has passed many bills, some with unanimous support and several with bipartisan support, but Reid will not put it up for a vote. So the dirty pool that you call on the House wrt the immigration legislation passed in the Senate goes both ways. Also, if you take every criticism against the House GOP and ask why the Obama super-majority for 2 years couldn't pass the same legislation being blamed on GOP for inaction, you might some answers other than "intractable politics" such as "will of the people." Yes, there is a chance for compromise but it takes two to tango (or three, in this case). I would also remind you that Senator Obama in 2007 was the deciding vote in Dorgan's poison pill that killed the Bush immigration reform (Kennedy was infuriated with Dorgan, btw), which I think was very left-leaning compared to the current GOP appetite on immigration. My point in raising this? I am suggesting that the "intractable opposition" you claim is 1) more propaganda than true when you look at the attempts to compromise, past and present, and 2) that Obama (then as Senator, and now as President) has had both opportunities (as Senator) and a responsibility (as President) to lead on compromise, but instead has dug in his heels because he holds far left positions that by their very nature make compromise difficult. The democrats will have the fewest seats in the house since 1930 and Tom reasons that it's because they haven't moved far enough to the left? We'll set aside, for now, the irony that the president had said, "this notion that somehow I can just change the laws unilaterally is just not true" has now become "I just took action to change the law." Or this quote from Mr. Cushing's original post above alleging that President Obama, while attending the recent G20 meeting "managed to isolate our nemesis Mr. Putin regarding Ukraine." It seems Mr. Putin left the meeting early so he could send additional troops with heavy armor into Ukraine, direct more Russian Air Force flights in order to provoke our allies and prepare for the launch today of a brand new submarine launched intercontinental ballistic missile that landed near Alaska. The missile was launched from a brand new nuclear submarine, part of a new fleet being built by Russia. ?Isn't voter apathy in and of itself representing a vote against through inaction?? Sort of. I do not think that the likely Dem voters saw enough of a stake in the outcome to bother. Gridlock abides and won?t change that much before 2016, and there was nothing to generate excitement. So in the same sense that ?not to decide is to decide,? it was a mild rejection of those candidates who lost, despite the fact that they were a pretty centrist bunch. However, I do not think it was much of a mandate for change in the rightward direction; rather, it means that more of those folks will vote anyway, regardless of excitement. That has always been true of the GOP partisans, they always vote. They were enough to constitute a majority of the totals, but it?s hard to see how that represents a clarion call. ?Obama did little in this regard other than speeches (perhaps that's your point), and one could argue is more in bed with Wall Street than Bush I and II by any meaningful metric? That IS my point. His bedfellowage with Wall Street is a major disappointment to me. Holder was a Partner in the Ultimate Insider law firm before becoming AG, and I do not think he had much inclination to move against his prior client-types. I think certain ones of them richly deserved individual prosecutions, and jail. Instead we got gee-whiz numbers on fines, that really aren?t that much in context, and no deterrence against future larcenous instincts. Now, maybe it?s just expediency born of Citizens United, in which case I really do fear for the country, based on a policy stranglehold that might just be too tight. I hope not. ?I would posit that a Democrat move to the left might engage more of the base, but a move to the middle would widen the tent increasing the # of potential votes.? I think this cycle?s candidates were already in the middle, as is the Administration. What would pass for a move left would be to advocate for 6-years overdue policies, regarding infrastructure spending, carbon pollution reform, progressive taxation and other stuff I mentioned in the text. What do you think a move to the center would entail, policy-wise? ?Many Democrats speak of gridlock as if it was a bug in our system of government rather than a feature?? I just do not buy that ?they both do it? rhetoric. This level of gridlock is unprecedented, and it derives in large measure from the Speaker?s fear/inability to manage his TeaPer wing of ideologues. List, if you please, some of these ?many bills? ? of significance ? that were tabled by Harry Reid. I simply do not think it goes both ways in any non-trivial degree. As to the President?s failure to compromise, two things: ObamaCare really was already a compromise as introduced, since it was hatched in a GOP-dominated think-tank. Single Payor would be the Dem plan of choice. Perhaps it was a tactical blunder not to lead with SP and settle for the ACA, but remember, Obama was trying at the time to be post-partisan. Big mistake, obviously. Second, to the TeaPer wing of the GOP, compromise requires capitulation. There?s no ?give? in the zealous, only ?take.? I will read the Politico article, but I am dubious of any sudden inclination to compromise on immigration after 500 days. I also do not view Mr. Obama as ?far left.? That?s just silly ? he?s significantly to the Right of Eisenhower, for cri-aye. @ Dan: interesting that you bring up 1930 so emphatically. Perhaps you?ll want to read-up on 1932. Typical of Mr. Cushing: he will state his side of an issue without the facts but tell those who disagree that they must prove their side. It is common knowledge that Harry Reid has run the senate like a dictator. Few bills coming from the house are ever brought to a vote in the senate. Republicans in the current Senate have often been unable to offer amendments to bills on the floor. Let Mr. Cushing prove that this is not the case. And here is a prediction. The Republican led Senate will allow more Democrat input than was the case for Senate Republicans under Harry Reid. And watch as Democrats demand the old Senate rules be brought back for presidential appointments, etc. As to the origins of Obamacare, it doesn't matter who might have thought of some of it's features. What matters in any legislation is who voted for it. This arguement has been a red herring used by the Democrats since they rammed the program through Congress before anyone had a chance to read the bill. "We have to pass the bill so we will know what is in it" said the courageous Nancy Pelosi. Had Democrats brought a few Repulicans on board with some compromises, all of this would have long since passed. Please, no more of these silly arguements Mr. Cushing. LOL! So if 1932 was a referendum on the Republicans due to their politics, then why go to great lengths to blame democrat voter apathy for the results of 2014? Nice bit of re-direction councilor, but you can't have it both ways. I'm begging you and all other lefties, please elect the most leftist progressive candidate you want to go up against the republican in 2016. The only way you lefties pass any legislation is if you lie, this is documented and indisputable. The country called you on it and you got shellacked. Waiting for your inevitable pretzeling. Bill Clinton was called a bad naughty boy. Then the same individual got arrested - Web Link - and tried to argue and lie after he was arrested? This article was about the lame duck, President Obama. He continues to be a gift that keeps on giving. Tonight Senator Mary Landrieu is another casualty of the Obama agenda. And this runoff election today in Louisiana also gave two more congressional seats to Republicans in the next congress. But who is counting! As Mr. Cushing advises, Democrats should move (further) to the left. Keeping Reid and Pelosi was a first good step. Moving Warren into a leadership role will help solidify the direction. Does anyone know when the Obamacare employer mandate takes effect? Hopefully in 2015.